I recently bought the Canon WFT-E4 wireless transmitter (known as the WFT-E4A in North America - something to do with allowable radio frequencies). 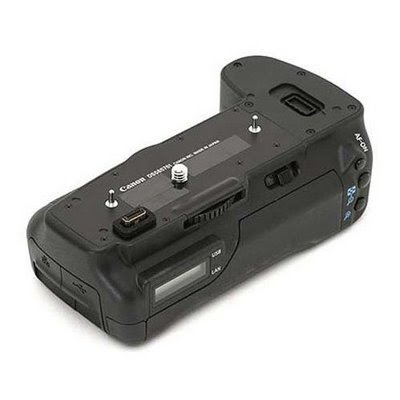 This device attaches to the base of the 5D mark II, a bit like a battery grip, and among other things allows you to transfer files as you shoot them over to a nearby computer. Similar models are available for the 40D, 50D, 1D III and 1Ds III. Firstly as an FTP client, it can transfer shots wirelessly to a nearby laptop while you shoot. Secondly, as a PTP client, you can have full remote control of the camera through EOS Utility, including a live view image, again – all wirelessly. This is a fantastic for setup for remote cameras. Thirdly, in HTTP mode the device starts a built-in web server and up to 3 people can view a dynamically generated web page of all the images it has shot, and also control when the camera shoots. I bought it primarily for the FTP functionality. When shooting on location with a client overseeing the shoot, it is important for them to be able to review the images as the shoot progresses. If you wait until the end of the day to review shots and the images aren’t quite what the client is looking for, it can often be impossible to revisit the location within the time and budget available. The screen on the back of the camera simply isn’t good enough for this kind of review, and also slows down shooting as people stand around the camera. Previously I have either had to shoot tethered to a laptop via a Firewire or USB cable, or where that is not practical, frequently changing out CF cards and have an assistant copy them onto the laptop. Neither of which is ideal. Now I can shoot without any cables getting in the way, and full screen images pop up on the laptop soon after I shoot them. Transfer speeds are in the order of 1.5MB/sec. So a RAW file still takes in the region of 15 secs to copy over, which is too slow for most uses. However, if you shoot in RAW + JPEG mode, the transmitter can be set to send only the JPEG files. A small JPEG is still plenty large enough to display full screen on the laptop, and they pop up on the screen in about 1 second. You can set the camera either to transmit every file as soon as it is taken, or wait until you play back images on the screen and transmit only those you select with the SET button. Both these modes can be useful depending on the type of subject matter you are shooting. 1) While the WFT is a great bit of kit, it is hard to get set up. The Canon manual is 107 pages long and assumes you are very familiar with networking jargon. After a day and a half of getting fed up I eventually got it working. In the next post I’ll explain how to set it up the way I am using it, in case anyone else is having trouble. it's funny I was just looking this up last night. I may be picking one up my self. I'd go for it if you think it will help your workflow. Once you get it up and running, the FTP works well. I can't comment on the other functions yet as I haven't tried them - PTP and HTTP are not so interesting for my uses! I have had no luck in finding one of these for my 5DII. Any suggestions? Are you using an access point hooked up to your computer or relying on the built-in WiFi card? I found that on a MAC if you use the built-in WiFi then it's sometimes a bit of a pain to have to go create the ad-hoc network all the time as I can't seem to get the computer to remember the network. I also found that fixing the IP address of the computer and camera manually is the most reliable method of ensuring it all works. But this apart it does work. Are you thinking of the GPS or hard disk functions too? You can do WiFi & GPS simultaneously. I know of one tog who uses a WiFi adapter on an EOS-1D Mark III and a few small hard disks as on the road backup when packing very light. I'm just using the built in wifi set up as an ad-hoc network. The intention is to be able to use it on location away from mains power, no having an airport express or whatever would not be useful. I fix the adhoc network name and the IP address of the computer - that way you can have saved settings on the camera and not have to re-configure it each time. I'll write about setting it up shortly. Help! Any instruction on setting up the WFT-E4 on a MacBook Pro for FTP? Please..your experience is needed. Step by step would be great! Thanks for your review! Can you please give me a guide to the outdoor range and JPG transfer speed?? Also, is there an external (long-range) aerial available for this model? I shoot lots of photos at music festivals, and am considering the possibility of a "live" photo feed. Bussboy - it will work up to about 30m outdoors, sometimes even further, although for some reason it doesn't work well over water. Transfer speeds are in the region of 1MB/sec, so a small JPEG will transfer in 1 sec, while a RAW file will take approx 15-20 secs. For concert shooting you might want to also look at HTTP mode, where the images are available via a web browser on a remote computer - just a thought. Julian, Thanks it only took me 3 days to find this site. Also, what software are you using to have the images directly display on the screen? I'm using Lightroom with an auto import folder to view the images. Apparently they appear more quickly using EOS zoom browser, but I find it a horrible peice of software to use...so I'm happy to wait a few extra seconds for Lightroom. Thanks for article - I intend to set up a WFT-E1 with a 5D classic - can iphoto be used to display to screen ? I have tried to use the WFT-E4 with my Windows PC and have had no luck. I have spent hours with the Canon IT support. Any tricks on getting this to work on a Windows system? Hi Julian and thanks for your great guide. I have the WFT-E4 too and I offen use it as FTP transmitter directly on the mac (thanks to your guide) or via wi-fi router with external antenna for longer range. The thing that I'm not be able to do is to connect it to the mac in PTP mode, i can do it with the pc but I have some trouble to do in on my mac book. The goal is to use the mac as a bigger screen to see images directly after shots without pass trought other program like lightroom that I use for slideshow. Are you able to do this ? Have you ever successfull do this procedure ? Hi Julian and thanks for this article. I am a little confused as to the difference between the WFT E4 ou describe and the newer WFT E4 II. The latter is cheaper but seems to do all that the former does. Is this right? I've just ordered the WFT-E4 II with plans to use it for a big event in a couple of weeks. Your tutorial and the postings are wonderful BUT - can you refer me to similar detailed setup instructions for us underprivileged who use a PC (Vista or Win 7)? Looks like Julian has stopped viewing this page. See last comment from before Christmas! Not sure if windows 7 , vista home versions allow use of FTP I heard microsoft disabled it on all but their pro versios. Might need to make sure you're running that. Not sure though, cos not a windows user. Hello Julian, very nice post! So helpful, thank you. I wonder if the transmitter will allow me to send images directly into devices such as the iPad. It would be very light and practical for me. Hi Jim - sorry I don't know anything about Windows - you're on your own there. G.M. - I don't have an iPad, so cannot confirm whether it would work. However, my understanding is it has the same 'closed' file system as the iPhone (which I am familiar with), so you could not chose a target directory for the images...so probably not. Thanks so much for this info. I thought I was pretty tech savvy till this thing! Now just to find a software that will auto-select the newest shot image...any suggestions? So used to tethered shooting to Aperture, got used to being able to see the latest image..
correct me if im wrong,all the frames you shoot will go directly to the computer right? but is it possible for example to send only 2 photos to the computer instead of all? Is there anyone out there who has experience with windows 7 working with the canon wft -e4? does it work together ?? I finally got the WFT/E4 working with windows 7. Albeit after spending many hours on the phone with Canon 2nd tier help. It will send but I have to switch off the firewall then as soon as it sends and if you open a pic to edit you lose the connection. I'm on a PC (well laptop) It's been a nightmare to set up - Julians guide was good but of course he uses Mac. At the moment I'm contemplating selling. Do you know what software the photos go to on the laptop(PC)? Can it jump strait into Lightroom? Or does it go in as a generic "my computer" interface? I'm thinking of getting one to use it like how you use it, which is to show clients the progress of the shoot. Can the client go back and forth from shot to shot? The images will simply appear in the folder you designate when you set up the WFT. You need to import them into your image viewer of choice to do anything with them. What I do is create a new catalogue in Lightroom prior to the shoot and have it set to auto import from that folder. Whenever a picture arrives in the folder it will then appear in LR a few seconds later. In full screen mode LR will automatically show a new photo as it arrives. A client can also scroll through the photos, rank their favourites, etc - exactly as you describe. Nobody talks about using WFT for connecting with an external ( hard drive) storage for shooting large video files !!!! camera storage is limited to 12 minutes video !!! Anybody experimented ?? Just bought this device. I am struggling to pair it to a mac any ideas? I am thinking to buy another transmitter for my assistant to shoot at same events as me, so we would in effect have 2 x transmitters shooting direct to 1 Macbook pro via FTP Ad Hoc. I tried to switch the transmitter between the cameras and when it connected it came up with a message saying there was another device utilising that IP address...so my question is, do you know if its possible to connect 2 cameras with the transmitters at same time, I dont know anyone else out here with one to try it before i buy....lol.. Grateful for any advice on this, I cant find anything else online or from Canon....cheers dude. Hi Gary - glad to hear the guide has been useful to you. I've never attempted what you're trying, but I think one of the improvements of the newer WFT-E4 II was that it allowed multiple transmitters to connect to the same network / laptop. Don't take my word for it though! Please report back if you manage to get this working - it would be useful info. Any ideas if you can use 2 x Cameras and WFT to 1 x Macbook? I've got it running perfect with 1, but I get error messages when i switch the WFT to another camera with exact same settings, it says that another device using that IP address....any ideas on that? We using the 1 camera to 1 macbook with great success here in Hong Kong...Cheers for your help on the setup its been running great for almost 2 years! cool, I'll give it a try when I can get hold of one...i think i resubmitted my message by mistake as i thought it didnt send...cheers...actually if anyone wants to see a live video of your setup working to a 30 ft screen via lightroom, i have a video of this on my site, heres the link, its the 2nd video i think in the events section: and demonstrates me shooting and transmitting with JPEG Large files to macbook pro behind the scenes which is plugged into the massive screen behind me at outdoor event....mac setup on lightroom full screen view with lights off so images just pop in...awesome! Thanks for sharing the video - fantastic way to show off the potential of the WFT! d my 5DII with WFT-E4 and a 1DIV with WFT-E4 II together with a macbook but not directly adHoc, but with a router between. I think that isn't possible to connect more than one device directly to the macbook, but with the router you can connect many devices as you want. I have read all of you input and it is very helpful. Can you please assist me with the step by step setup of the WFT-E5 to my EOS 7D? I would greatly appreciate. I was shooting yesterday with my Canon 5d Mark II using a USB cable in Adobe Lightroom Tethering and the cord got unplugged by accident and now every time I plug in the cord to the computer I get a USB device has malfunctioned. I need to buy one of the WFT-E4A Transmitters to do this as it does save time for people to be able to see the picture right on a separate monitor. It seems it works only for those who have the 1st edition of it, but not the lestest. Do you know where i can get info about mine? Julian, I have a question. It can be use with Capture One software? My appreciation for your effort and guidance given on your website. It is very helpful. I have the same WFT-E4, what is the difference between it and the WFT-E4ii? I havent been successful connecting it wireless to an ipad without a wireless router in the mix. Please tell me does the original unit do this or do I need the updated E4ii? I have the same version ! and I connect it directly (without router) but with macbook, not Ipad. Is it possible to shoot wirelessly with the wft-4 beaming images to the ipad while the camera is tethered to a laptop? That way you have the ips laptop to judge color exposure while the client holds the ipad. Thinking of getting one, can I be printing images from aperture whilst receiving images? Looks like I can make a folder on my desktop to receive images and import to aperture as and when I have a convenient slot and then process to print whilst the desktop folder receives images. can you use the WFT-E4 IIA from a 5D Mark II to a Mac, with out internet connection to edit the photos? From my reading I would be using the FTP Transfer Mode. if so how far is the farthest distance ? I am looking to take photos about 100-200m away from my computer, once the photos are taken I want them sent to my computer where they will be edited. We are in an area with no obstructions (walls, trees etc. ) however the area has little to no internet. any info is helpful, Thanks so much. All of the above advice and questions have been very informative. Interet is not necessary, but to cover such long distances you need a really good access point or a signal repetitor between your router/AP and the camera. I successfully use the WFT (mine is the MKI but I think is the same) over 150 mt. placing an access point on the top of a bar of 5 meters with an external antenna and I was able to send pictures, but always with the antenna in the field of view, without any obstacle between the camera and the antenna.